Life in a Derbyshire village is set to be turned upside down when it is invaded by foreign trade officials. 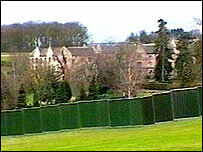 Breadsall Church of England Primary School is to shut for the duration of the G8 Summit later this week. The step has been taken amid safety concerns for children as some residents fear the event will attract protestors. Environment and development ministers are scheduled to arrive in the Derbyshire village on Thursday to discuss climate change. Head teacher Gayle Goodwin said: "We were quite concerned to find that protestors may be arriving both nationally and internationally. "Obviously we can't take it upon ourselves to guarantee the safety of the children." Police in the area have already been granted extra powers to stop campaigners travelling between the city centre and Breadsall Priory Hotel where the event takes place. They want them to gather at an agreed central meeting place. A number of roads will be closed in and around the Breadsall area between Wednesday and Saturday.